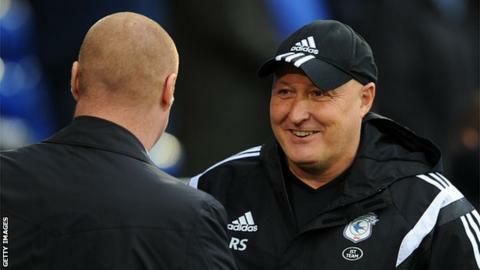 Cardiff manager Russell Slade is confident his squad can cope with the increased levels of pressure in the Championship run-in. The Bluebirds are two points off a play-off spot with seven games remaining after their win over Derby County. Slade's men visit Turf Moor on Tuesday night to face league leaders Burnley, unbeaten in their last 16 matches. "We have showed we can cope with pressure," Slade told BBC Radio Wales. "I think the players have shown that on several occasions." Slade feels Cardiff have done well in the biggest games of the campaign, despite describing Turf Moor as the "hardest" place to visit in the Championship. "On Saturday we won in front of a fantastic crowd and were pleased we put a smile on their faces," said Slade after Cardiff attracted their biggest gate of the season. "We have produced in big games, against Brighton, Ipswich, Middlesbrough and again on Saturday. "The lads have a real spring in their step now. The prize is big. With seven games to go, there is still a prize there for us. "We want to take the opportunities when they come along and take this season all the way. "Burnley is a tough game, no-one gives you anything on a plate, but we are grateful that we can fight on and have this opportunity." Burnley boss Sean Dyche expects a tough game from the Bluebirds. "Cardiff pose a challenge. They are hanging around that play-off zone and they want to push into the play-offs so they've got their own challenges this season and we've got ours, but we can only concern ourselves with ourselves," he told the BBC. "I like Russell Slade and I think there is an honesty to his words. "In Cardiff we had to display character to get a point and I am sure it will be the same."